Mike Nevin previews Liverpool v Cardiff as an old enemy comes back to town. Neil Warnock brings his Cardiff City side to Anfield tomorrow no doubt intent on a bit of needle in an attempt to put a spanner in Liverpool’s title works. Warnock has always been a spiky, controversial character with a penchant for rubbing up Liverpool fans and managers the wrong way. He took a particular dislike to Rafa Benitez when, in 2007, the Spaniard rested half a team at Fulham in the lead-up to the Athens Champions League final against AC Milan and the Reds’ defeat at Craven Cottage contributed to his Sheffield United’s relegation. Prior to that in 2003, Warnock had a public spat with Gerard Houllier (and Phil Thompson) when the Reds lost at Bramall Lane in the first leg of a Worthington Cup semi-final and rubbed salt in our wounds by pointing out his collection of British journeymen costing £600,000 had trumped a cosmopolitan Liverpool side worth over £100 million. Warnock is thoroughly old-school, suspicious and sniffy about foreign methods, a doyen of the insular League Manager’s Association and a former Sir Alex Ferguson acolyte. He sees himself as a bit of cheeky chap; a trademark grin never far from his face but a little dig at the Reds seldom far from the lips whenever he has crossed our path. As much as the gnarly Yorkshireman can grate there must be some admiration for a man pushing 70 years of age with the desire and sadistic pleasure to manage teams with the sole intention of survival. In reality Liverpool have nothing to fear from Warnock’s Welsh outfit despite the Bluebirds achieving their first Premier League win of the season over Fulham in last weekend’s 4-2 home triumph. If Cardiff are to survive the drop, points accrued from games against their relegation rivals will likely determine their fate. In one respect tomorrow’s game is a free hit for the visitors but they will look to frustrate and would probably settle for escaping without too much damage to their pride and goal difference. For the Reds it’s a chance to build on an encouraging European performance in midweek and get back among the goals on the domestic front. 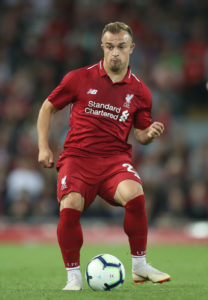 Jurgen Klopp’s selection and formation against Red Star Belgrade gave the first real hint this term of his side’s ability to embrace different systems with a minor switch away from a rigid midfield behind his front three. With the super-consistent Gini Wijnaldum and Fabinho holding and Xherdan Shaqiri wandering centrally between Sadio Mane and Mohammed Salah, Roberto Firmino was able to operate as a more obvious focal point in the attack. With Manchester City due at Wembley on Monday night for a clash with Tottenham, the Reds can reassume the leadership on Saturday and hope that Spurs, with their own challenge at the top gathering momentum, can turn City over. The enduring frustration of this season has been watching the title favourites routinely despatch the cannon fodder of the division with a glut of goals so a sterner test for City could see Liverpool clear by the time we travel to Arsenal next weekend. Here’s hoping! Regardless of the team Klopp selects, anything but a comfortable victory would be a major shock. Mo Salah is probably due a break at some stage but with him rediscovering his scoring touch over the last week, he will be itching to add to his tally. The manager has to decide whether he can occasionally do without his talisman in home matches against the lesser lights and feel secure there is more than enough guile and firepower in his squad to befuddle a mass defence. The Reds have yet to concede a goal at Anfield this season and Cardiff are unlikely to present much of an attacking threat to endanger that record. Three points – as ever in this unforgiving race – are a must but an emphatic Liverpool win would restate all of our ambitions and put the old dinosaur Warnock back in his box.